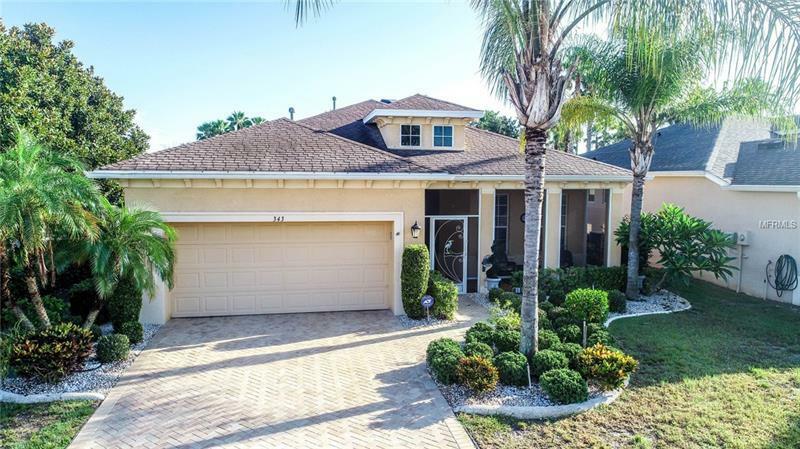 This Sorrento model home built in 2007, is absolutely remarkable. Tons of upgrades, improvements, and very well maintained. The Gourmet kitchen boasts 42" wood cabinetry with soft-close drawers, matching stainless steel appliances, and even a kitchen wall-mounted tv that will stay for buyers convenience. The range and hot water heater run on gas, and the home also has a reverse osmosis water softener. Carpet has been recently replaced and the rest of the home features premium laminate flooring and ceramic tile. You will be amazed the moment you walk to the front door, as the front porch is completely screened in to allow you to enjoy a cup of coffee in the morning bug-free. The 20x26 screened & covered Florida room is truly the homes best feature. It offers plenty of space to entertain and enjoy the beautiful Florida weather. Some of its features include ceramic tile floors, a summer kitchen with a small fridge that will remain, and new window treatments. The home even has a Dual alarm system (ADT) connected with newly installed security hardware, and mounted cameras. This gorgeous home won't last long.